One Last Time, Thank-you, BURR. I knew this day was coming and yet it still hurt my heart to learn the news that Alex Burrows has officially retired from the NHL. Heart and soul every shift on the ice and off of the ice in the community. The answer is simple. How could I not root for him? An example of pure determination, constantly working towards his dream and achieving it despite the odds. Undrafted and never meant to make it in the NHL, forever left an indelible mark with a franchise with memorable goals and a massive heart. From the outside, his opponents and opposition fans merely saw a pest but in Vancouver we saw him as an inspiration. Burrows defied the odds. Never drafted, worked his way up from the ECHL to the QMJHL to the AHL to the NHL. Even when he finally made it, NO ONE could’ve predicted what would occur. Most thought he’d simply be a 4th liner/pest to his opponents for the entirety of his career at best. I doubt anyone even considered that he’d become a first line player or have multiple +25 goal seasons. There was tons of negativity that came his way from the media and fans that didn’t see what Canucks fans saw on the daily. And he handled it with grace, never let it get to him, rising above it on every occasion. From a rookie to a seasoned veteran mentoring young players, he did it all. No one could have predicted that he would become the one of the best line mates to skate along with the Sedin twins or score some of the most memorable goals in franchise history. People say that the twins made Burrows and there may be some truth to that BUT no one ever opened up space on the ice for the twins like Burrows. He was also vital in their successes as well. There’s a reason why he was at times considered the “third Sedin”, he seemed to read their passes almost as well as they did and seemed to almost always anticipate the place they passed the puck. For years it was absolute magic. So while many on the outside remember Burrows for his on ice antics or being a pest, Canucks fans will always remember him for his heart and soul. He gave everything from his humble beginnings of working his way up to the league, to his rookie days to his successes as the Sedins winger to his work off the ice in the community and for using his voice to raise awareness for the importance of mental health. 822 games with the Vancouver Canucks, 913 regular season games overall, not too shabby for a guy who was never drafted. He embodied what it meant to have the heart of a Canuck from the beginning to the end of his career. And to THIS fan, he will always and forever be a Canuck. I’ve said it before, but it still remains true; when I have felt like giving up, all I have had to do was think of how he always kept pushing forward despite the odds and I would be reminded that when you tune out the negativity, with hard work and perseverance, anything is possible. Thank-you doesn’t seem quite enough but one more time, it’s what I have to offer. Thank-you for everything, BURR. I never thought I would write one post about this, let alone two posts in three months. (Part One). It is still true that I am a female hockey fan. The fact that I am female and a hockey fan should not influence how I am treated about the game but lately that has been happening far too often. In all honesty, I had plans to write/share a different post until yet again while attending a Vancouver Canucks game with my sister, I was left frustrated and rattled as a female hockey fan. This time, we were berated all game for our choice of jerseys, when and how we cheered and for simply being females at a hockey game. Yep, by wearing our Bo Horvat and Daniel Sedin jerseys, it meant we were delusional and should burn our jerseys. Burn my jersey? Sorry, but that is never going to happen. And didn’t we know that the Sedins are “sisters” and far too old for this game? What I do know, is that the Sedins are two of the classiest players in the NHL and both closing in on the 1000 NHL points milestone. And by being females at a hockey game meant that we deserved to be berated both to our faces and behind our backs throughout the entire game. Truthfully most of what was said is far too inappropriate for me to repeat. If you want to teach people more about the game, do not talk down or belittle them. I love learning new facets of the game, and debating the ins and outs of the game. If you want to share what you love about the game, share it, everyone has a different story. I love hearing what others love about the game and why. Once again it was as though we were being judged for the entire game regardless of whether we cheered or were silently engaged in the game taking place. And once again rather than being debated with or talk to, we were belittled. We tried to not let it rattle us during the game but underneath, of course it did. It made it us feel as though we are not allowed to be a part of the hockey community, as though perhaps we did not belong. And then I remembered once again that these individuals who act this way do not represent the entirety of hockey fans. Let me make this as simple as possible: whether you are a female or male hockey fan, you are allowed to enjoy the game and in no way deserving of judgement for being a fan. Every hockey fan is allowed to cheer for their team, their favourite player and certainly allowed their own opinion of the game. And even if hockey fans have differing opinions, that does not make them any less of a fan than any another fan. Hockey is a community that most days feels like family, and one day I hope that we stop judging and attacking one another. Hockey is more than just a game. Hopefully one day, we will not have to write posts like this, and all hockey fans regardless of gender will be allowed to simply love this game. Is it October yet? No, not just yet but the echoes around the bend are getting ever louder as we edge closer to the season’s opening puck drop. What does the 2015-2016 season hold for the Vancouver Canucks? According to the stats experts, the future looks grim and playoff hopes are very dim. According to the experts, there is little reason to cheer for a team that should be shifting their focus to rebuilding. According to the experts this team should expect to be at the bottom of the standings for a while. According to the experts, the Sedins are way past their prime and should opt to play elsewhere. According to the experts the entire Canucks roster is too old and not balanced with enough youth. According to the experts the Vancouver Canucks have absolutely no business even thinking about the 2016 playoff picture. According to the experts, Canucks should prepare themselves for a disastrous season. What exactly defines a “disastrous” season? A year under Torts? Or the “Messier” experiment that orchestrated the Linden trade? Canucks fans know all about disastrous seasons, we’ve been there a few times and then some. A disastrous season is hardly a new concept for most teams, they’ve all seen their share of disappointments, such is the nature of a game that can only have one champion at year’s end. Yes, disasters will come and go but no matter their nature, disastrous or successful season, I will be supporting my team from start to finish of the 82-game plus journey that is the NHL season. I’m in no way an expert, nor will I ever claim to be, BUT I will say that while the stats are helpful, they do not always tell the whole story. Perhaps on paper, this team may not look like a “championship” roster or a “typical contender” and perhaps that is okay. Perhaps the so-called expectations from the fans and the experts should be tossed out the window this year. Perhaps having a lack of expectations will be exactly what makes the Canucks a team to watch as the season progresses. Perhaps their veteran core supported by the younger players will be exactly what they’ve promised all along, a team that deserves respect. Perhaps they will be exactly what the “experts” predicted OR they just may surprise all the naysayers. The truth is no matter what the stats and critics say or what the team looks like on paper, all that matters is what happens on the ice when the season begins. How the team plays, regardless of who is on the roster, is up to them. Will the Sedins have year to remember or will they finally show their age? Will Ryan Miller have a rebound season? Will Bo Horvat have a solid followup to his rookie season? Will any rookies step for a breakout season? Will Brandon Prust win fans over with his experience? The questions are endless and time will tell what this season holds for the Vancouver Canucks. Is it October yet? No, not just yet but I can hear the echoes of what’s to come just around the bend. Do you remember the first time that hockey fully grabbed your attention and completely stole your heart for this game that is so much more than a game? Perhaps it was a past Stanley Cup final, the Winter Olympics, World Championship, an AHL affiliate game or perhaps even a local minor hockey team that simply captured you in a way that only hockey can and once it did, there was no looking back. I can remember the first that game I really watched from start to finish completely enraptured by this game and every sound from the cheers in the stands to the skates on the ice to the final buzzer. There is one thing that prior to really embracing a my Canucks that I never understood or was prepared for, the emotional component. Yes, it’s true that there is an emotional component to being a sports fan that goes beyond grief with the refs or players on the opponents’ team. There are the emotions that come with every win and every loss in the regular season but also those in the post season. There is the anticipation and excitement that builds as a new season inches closer around the corner. There is anguish of seeing players sidelined indefinitely with an injury and cautious excitement when that same player returns for their first game back. There is exhilaration when your team scores that big goal that leads to the next round and absolute heartbreak when you are on the other side watching your team’s season come to an end. There is the anxiety that kicks in around second overtime when you witness two teams battle for every inch of the ice in the post season. There is a veteran retiring from the game and watching him skate one last loop around the rink for the fans to say good-bye. There are the unexpected moments off the ice that unite the players once on the ice and prove that hockey is much, much, much more than JUST a game. There is the attachment that grows with watching players develop from a prospect to becoming a veteran franchise leader. There is the sorrow that comes when those franchise players get traded, leave to play elsewhere or retire. Trades and changes are an inevitable part of the game but that never gets easier to embrace no matter how often they happen over the course of a player’s career. Today was not a BIEKSALLENT day for this hockey fan. Today, the Vancouver Canucks and franchise player, Kevin Bieksa parted ways via a trade. There was no bitterness or anger on either side, just appreciation and respect for ten dedicated years. I understand that moves like this one have to happen and that it’s a part of the game but it NEVER gets any easier to see players that have become cornerstones leave. 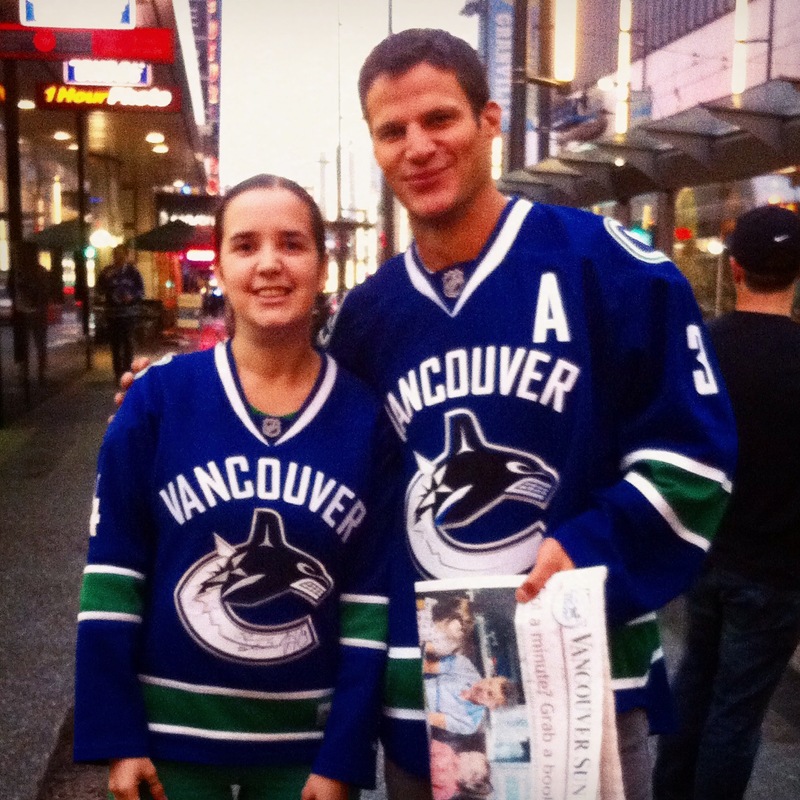 Players like Bieksa are not easy to replace for more than just his on-ice leadership contributions…he was a class act off the ice with the fans and many of the Canucks charities over ten years. Perhaps one of his greatest achievements OFF of the ice was his work in helping to shine a light on the importance of Mental Health Awarenss (Mindcheck) in honour of his friend, Rick Rypien. Juice, Vancouver will never forget everything you did over ten incredible years, and thank-you, just does not seem even close to enough but it is what we have to offer…THANK-YOU. You gave this city incredible moments from the beginning to the end while fully embracing what it meant to have the heart of a Canuck on and off the ice. From getting under the skin of the opponents to interview gold to that beyond amazing stanchion goal to your work with CFKF, Canuck Place and Mindcheck…you gave this team and this city more than we deserved. It truly was an honour seeing you play for the Canucks all this time and while I may never root for Anaheim, I do wish you the best over there, KB! #ThankYouJuice for this picture and the many Canucks memories! More than ten years into being a hockey fan and it still never gets any easier. Nope, it never gets any easier to see franchise players leave the team that developed them from prospect to veteran. The emotional component makes it hard to be a fan sometimes but it is also what makes being a fan so great. Hockey is so much more than JUST a game. On and off the ice, there are highs and lows that go hand in hand with being a hockey fan and it’s pretty incredible to be on the sidelines to see every step of each 82-game journey no matter the outcome. Calling all Canucks fans, it’s that time again…time for a summer of True Blue stories! In the Summer of 2014, I began a series on Nucksaid called “True Blue” that featured THE best part of Vancouver Canucks hockey, YOU the fans and YOUR stories. This year I would love to do the very same and invite any and ALL of you who would like to share your Canucks AND/OR your Utica Comets stories to take part in True Blue 2015! Whether you took part in the series LAST year or are participating for the first time, I would love to hear your stories and be able to share them with others. Whether you are from BC, across Canada or from across the globe, your stories are unique and make you a part of Canucks nation or Comets Army or BOTH. Those who participated last year made this an incredible series to be a part of and proved that this game that binds us all together is so much more than a game. If you ARE interested in taking part in the True Blue 2015 series send me an email to nucksaid@gmail.com with the subject line:TRUE BLUE 2015 for more details on how to take part in the summer series. Let’s make this another summer all about YOU and YOUR hockey/Canucks/Comets stories as we count down to the new season in the fall! Here’s making this another summer to remember!